Vienna, 30.04.2014 On April 30 at the 998th Permanent Council meeting of the OSCE, Ambassador Erfani sat on the head table panel of the OSCE with H.E. 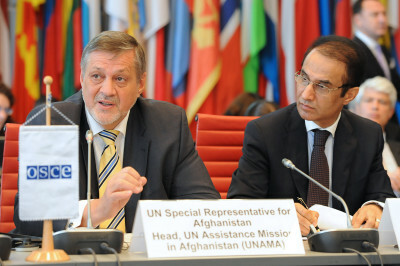 Ján Kubiš, Special Representative of the Secretary-General of the United Nations to Afghanistan and Head of UNAMA, who gave a presentation on the ongoing elections in Afghanistan. Ambassador Erfani responded to his address, thanking Mr. Kubiš for the continued support he has shown to the Afghan Government and people, and for the reassuring words of his presentation. Ambassador Erfani followed by giving a brief update on the elections in Afghanistan, which have been marked as a milestone in Afghanistan’s history. Ambassador emphasized that the new government will continue the successful path into the Decade of Transformation (2015-2024) and that the achievements in areas, such as: Women’s rights; Education; Media and Civil Society; Governance and democratization; Security; Foreign policy; Economy; Infrastructure; Repatriation of refugees; and Health, demonstrated the Afghan peoples’ determination to achieve a successful, stable and democratic nation. H.E. Kubiš concurred: “The Afghan people once again proved all the sceptics wrong,” he said. “You must witness a situation like this to believe in the stamina, in the courage, in the endurance of the Afghan people.” he said.